Eschalon Book 1 was, by all accounts, a surprise hit from Basilisk Games. 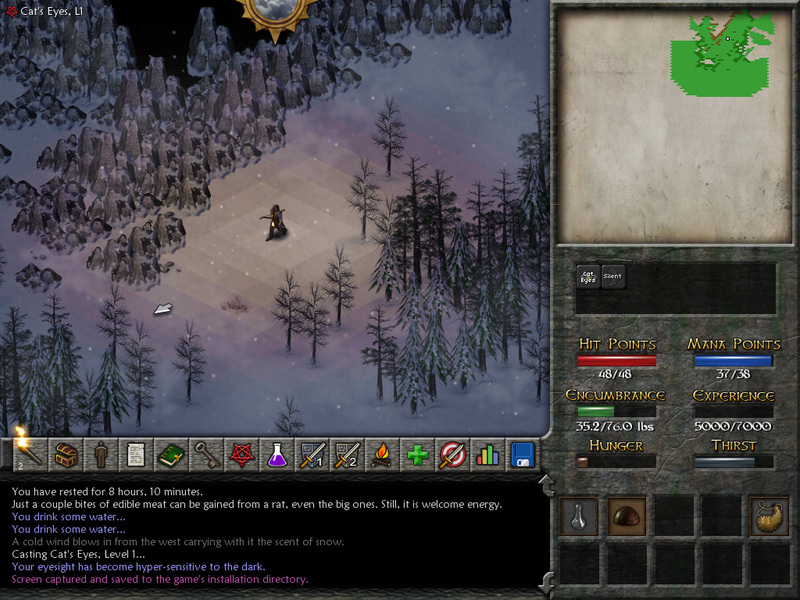 A nice RPG that encompassed all that was good and wonderful in a classic Ultima, Baldur’s Gate style. Eschalon Book 2 has improved that old school turn-based RPG feel with some nice graphical and story tweaks, whilst keeping to the much loved tradition of the isometric RPG. The game starts with the good old character creation tool. You can pick male or female, your origin (each has a particular trait), your axiom (whether you are a devout believer in the Gods, a Druid or an atheist, each of which comes with different abilities) and, finally, your class (be that fighter, ranger, magic-user or healer). It’s at this point you begin to realise the sheer immensity of the game. Just choosing and naming your bod is fair enough, but then deciding on what skills to apply or how many attribute points to allocate to your strength, stamina or dexterity can leave you sitting on the character creation screen for some time. And on top of all that, you’ve also got to choose a picture, either from a pre-loaded selection of Crime Watch photo-fit candidates, or upload one of your own creation. Planning ahead as to what kind of hero you will control is essential. I usually try to fit myself into a basic all-rounder, but this won’t work well in Eschalon. To succeed you will need to choose your path and stick to it. After the character creation you have to decide on the difficulty level. The difficulty settings are based on whether you want your character to require food and water, or if weapons degrade over time, making the game as ‘real’ as possible without ruining the element of fun. After all that, you’re introduced to a nice cut-scene detailing the history and story behind Book, followed by a tantalising introduction to Book 2 and your current predicament. You wake up in a cottage with little memory as to who you are, or how you got there. A quick look around doesn’t reveal any traffic cones, so at least you know you weren’t out in Great Yarmouth the night before. However, upon opening your door you find a mysterious noteasking you to meet someone in the nearby village inn. From here on in, it’s up to you. If you’re expecting a loving hand-holding tutorial, then forget it. You get a basic ‘point your mouse and click to move’ and a run down of the interface and various icons available. This isn’t a bad thing, in fact hitting the ground running is a nice change from the half-hour long tutorials that most games seem to have these days and Eschalon Book 2 is as easy to get into as it is addictive. Speaking of the interface, it’s actually quite intuitive, with the icons represent your inventory, quest log, spell book, fighting stance, save game and your alchemy mixer. As with all RPG’s, the higher the level of your character the better you’ll be at combat, spell casting or mixing ingredients into potions. Unfortunately, those of you who played Book 1 and still have the saved character will not be able to import it into Book 2, we all start at level 1 so getting out and about is the order of the day. But on the other hand, you don’t need to have played Book 1 already, as Eschalon Book 2 kicks off with a fresh new start. Luckily there are quests-a-plenty. Almost every character you come across in the nearby villages has some kind of quest that will earn you gold and experience points. Some are easy enough, some require a little more exploration and the battling of numerous beasts. Which brings me nicely to the combat. Although a turn-based RPG, every move you make is classed as a turn, nothing happens if you don’t move. When you see an enemy you have to approach them to within a few steps, then click away whilst the game works out the die roll numbers, counting in any modifiers or penalties either you or the enemy has. The same applies for ranged combat. Your speed and ranged skills will be taken into account with the roll of the virtual die. It sounds like it should take a while, but in reality the combat is pretty quick and very satisfying when you win. Although, don’t expect to win every battle first off. It takes a good few deaths, saves and many more hours of play until you are capable of dealing out some pain to the wolves or outlanders. 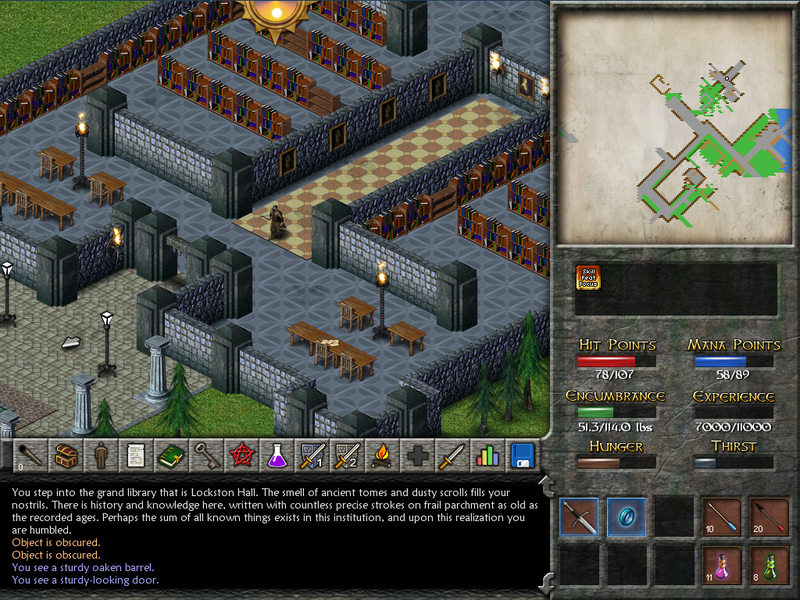 Needless to say, you’ll spend most of the beginning of the game ignoring the main quest and trying to reach level extraordinary, just so you can wander from town to town in relative safety and find enough gold to keep your weapons and armour in good nick, as the ones available at that start of the game appear to be made from glass and break at the first stab. But that doesn’t mean the game is unplayable, it’s just a little difficult to get off the ground if you’re not used to this kind of genre. There are some really good features to Eschalon Book 2, such as the environmental and weather conditions. As the cycle of day to night spins in the graphic at the top of the screen, the world around you begins to darken until, unless you are near a town or a lit candelabra, everything becomes pitch black. Lighting a torch will furnish you with enough light to cast a lozenge of orange about your person, but anything beyond that little pill of light is in complete and utter darkness until the dawn approaches. Quite wonderful really. Similarly, have you ever tried to light a torch in the middle of a storm? Well, unless you are lucky, you won’t be able to in Book 2. The rain buckets down in torrents with great effect, causing your character to slow down his/her movements, spell casting and combat abilities, and when you walk to frozen regions of the map, a sudden snow storm and a drop in temperature can make you want to dive for cover and light a fire. Although the graphics and isometric view point won’t win any awards for their technicality, they serve the purpose of the game and keep the feel of the story adequately enough. Sound and music are really good and fit the fantasy bill with impressive flair. Standing in the middle of the forest, for example, your speakers will assualt your ears with bird-song and wind rustling through the leaves, as will the bitter chill wind, whipping about your under garments in the frozen wastes, enough to make you cold just thinking about it. The gameplay works well, but it can become a bit boring after the umpteenth battle with a rat. I would suggest, without tarring anyone in particular with ye old brush, that Eschalon will appeal to those who loved the classic RPG’s of yesteryear. There’s so much more to do in Eschalon Book 2 that I can possibly write in a review. 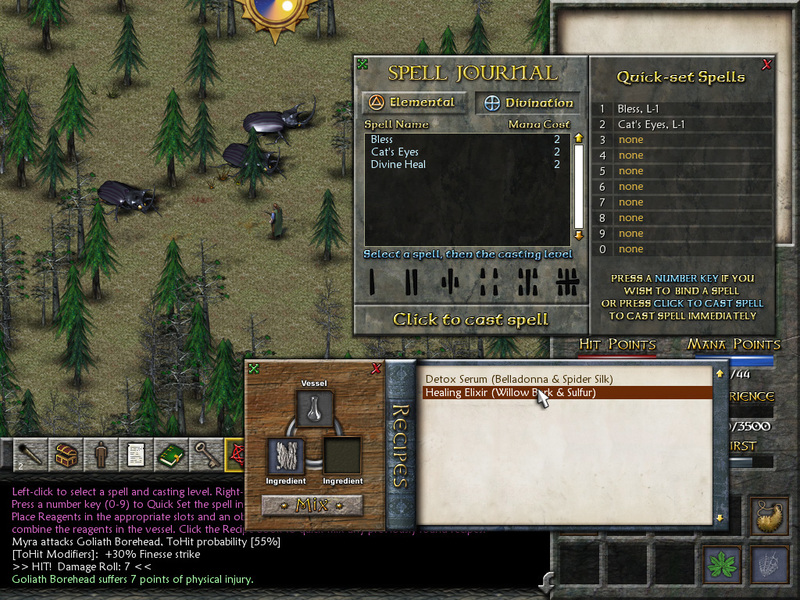 It’s a very good RPG and despite the old school look and feel it works really well. The game world is huge and there is certainly plenty to do, however, you’ll most likely end up restarting the game a few times just to get the best start for your character’s skills and stats. Eschalon Book 2 is a good game, very absorbing, with ten’s of hours of play just on the main quest alone.